This item can be purchased with Financial Aid. We are sorry, gift cards CANNOT be purchased with financial aid. 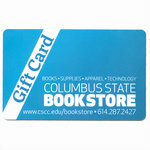 Gift cards can only be used inside the Columbus Campus Bookstore.